CareMount Medical, the largest, independent multi-specialty medical group in New York State, is pleased to announce Vikash Panghaal, MD, Radiologist has been named a 2018 recipient of the Dutchess County Regional Chamber of Commerce’s prestigious “Forty Under 40 Mover & Shaker Award.” The annual award recognizes 40 individuals under the age of 40 who have shown a strong commitment to the Hudson Valley. Dr. Panghaal joined CareMount Medical’s Radiology Department in 2013 and was the medical group’s first Musculoskeletal Radiologist in Dutchess County. Today, he serves as the Director of Musculoskeletal Radiology, where he provides diagnostic evaluations for patients after they undergo a CT scan, MRI scan, ultrasound, mammogram, or x-ray. He also assists with guided procedures through the use of ultrasound to biopsy a lesion or to inject a joint to help ease pain. Dr. Panghaal is presently the youngest member elected to CareMount Medical’s Board of Directors. Dr. Panghaal received his Bachelor of Science degree in Chemical Biology from Stevens Institute of Technology. He earned his Medical Degree and Master of Business Administration in Health Care Management from Robert Wood Johnson Medical School and Rutgers Business School. He completed his residency in Radiology and his fellowship in Musculoskeletal Radiology at the Albert Einstein College of Medicine, Montefiore Medical Center. Dr. Panghaal is board certified by the American Board of Radiology. Dr. Panghaal volunteers with the Dutchess County Medical Society Executive Committee and serves as a Delegate to the American Medical Association. He has published numerous articles in peer reviewed radiology/rheumatology journals. He is married to Rupal Panghaal, MD, FAAO, Ophthalmologist at CareMount Medical. They reside in Dutchess County with their two children. For a list of CareMount Medical providers, visit: www.caremountmedical.com/directory/people/. 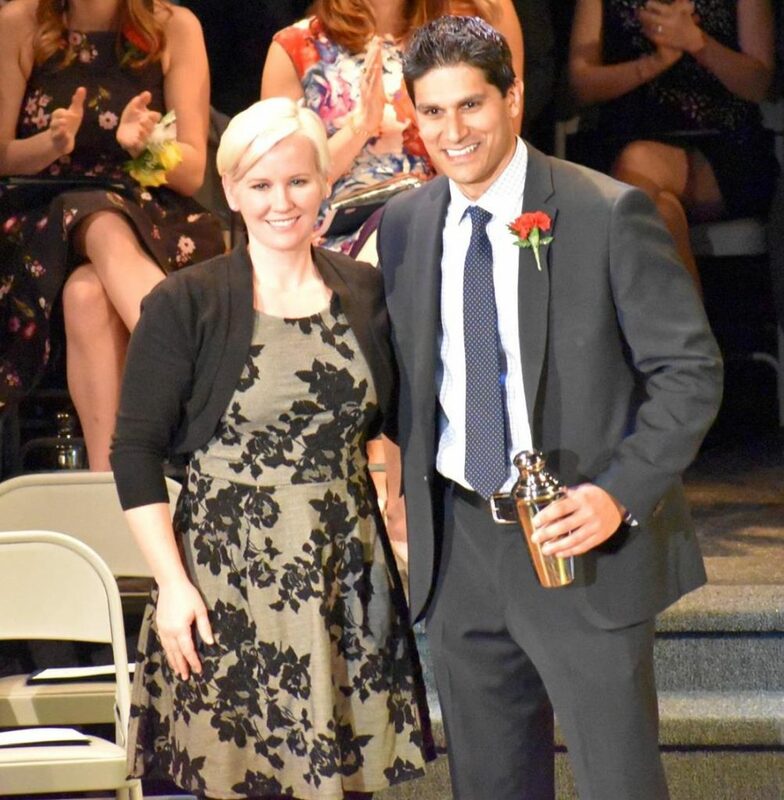 CareMount Medical Breast Surgical Oncologist and 2017 Forty Under 40 honoree, Diana L. Silverman, DO (pictured left), presents CareMount Medical Radiologist, Vikash Panghaal, MD, with his Forty Under 40 Mover & Shaker Award. Dr. Panghaal was presented the award at the Dutchess County Regional Chamber of Commerce’s annual Mover & Shaker awards ceremony, held April 5th in Poughkeepsie, NY. Photo provided by Dutchess County Regional Chamber of Commerce. CareMount Medical, P.C. is the largest independent multispecialty medical group in New York State, providing comprehensive medical care of the highest quality to 550,000 patients in more than 40 locations throughout Westchester, Putnam, Dutchess, Columbia, and Ulster counties. Founded in 1946 as Mount Kisco Medical Group, CareMount has grown to approximately 525 physicians and advanced practice professionals representing more than 40 different medical specialties. CareMount is affiliated with world-class organizations including Massachusetts General Hospital, Mount Sinai Health System, and Memorial Sloan Kettering Cancer Center. CareMount offers on-site laboratory and radiology services, endoscopy and infusion suites, and operates eight urgent-care centers. Our physicians are frequently recognized as best doctors in respected publications and have been featured in lists including New York Magazine’s “Best Doctors,” Westchester and Hudson Valley Magazine’s “Top Doctors” as well as in Castle Connolly Medical’s “Top Doctors.” For additional information about CareMount Medical and its specialties, please visit: www.caremountmedical.com. CareMount Medical is a registered service mark of CareMount Medical P.C.